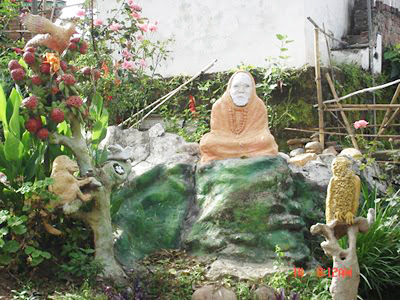 When he came to Khaptad, he was already a very wise hermit and very as old as 60. Before this, as a medical doctor trained in England, he was once, desperately trying to save the life of a child. But minute by minute, the child was going towards the dark cave of the death. He found himself utterly helpless. Then, a hermit came in his town of Jammu-Kashmir with Himalayan herbs and power of Yoga, saved the life of that child. Then, the young doctor knew that the would power ( the energy of thought) and Himalayan herbs were far more powerful and useful than the modern medical science. He gave up his flourishing medical practice and started studying Vedas and Upanishadhas. He was spending more and more of his time with the spiritual gurus. 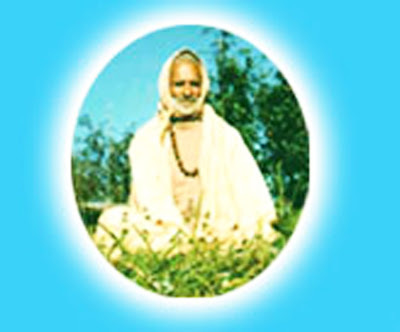 Eventually, the well established doctor became Sri 1008 Paramahansa Schitananda Saraswati, popularly known as Khaptad Swami, who died on May 9, 1996, probably at the age of 130. (Khaptad Swami never disclosed his past identity as a true Hindu Yogi and wanted to get Nirvana in peace and in seclusion). As in the Vedic times, as a hermit, Himalayas attracted him. He traveled throughout, from Kashmir to Meghalaya. But Khaptad Plateau of Far-Western Nepal attracted him most and he was pulled by the magical charm of this land of pre-historic Yakshyas and Haptalite Sakas and Khashas. Very soon, after establishing his hermitage over a small cave, he realized that Khaptad Plateau was the centre of ‘Latter-Vedic’ civilization (of Mahabharata period ) and an unfathomable storehouse of magical herbs. He had told a Nepali historian that he had seen some prehistorical archeological antiquities inside the deep birch forests. The ‘Nephtalites’ (later on called Heptali Khashas) had come from the west of Iran and crossed Himalayas and started a civilization in Khaptad Plateau. They were originally sun worshippers and devotees of Vedic god ‘Maruta’(later on called Masto) the shapeless god of wind. The ‘Masto Cult’ is even now, very dominant in this part of Nepal. As a travel writer says, a face to face confrontation with the typical western Chhetri inhabitants, possessing swarthy complexions and Caucasoid features and the head on collision with the Masto deity will be an experience of a life time, even now. One can imagine as to how a sophisticated intellectual Yogi and a former medical doctor like Khaptad Swami, must have lived and communicated with these Khasha Dhamis (Shamans) and buffalo herders, some 60 years ago. 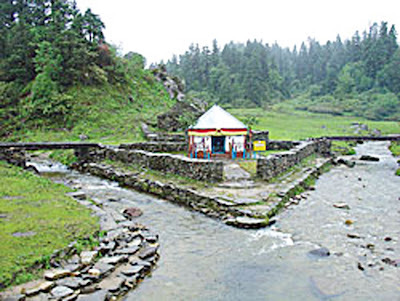 Khaptad Swami knew from the study of Puranas, that Lord Shiva had, for the first time, used medicinal herbs to cure the sick in the foothills of Khaptad in Baidhya Nath in Acham, while waiting to marry Goddess Parvati. 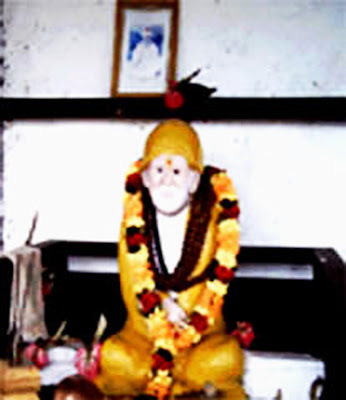 The Khaptad Baba, followed Lord Shiva and started curing the sick. He had also known that the heap of wealth of Lord Kubera, was in Badi Malika near Khaptad, but the wealth in the form of gold and precious stones meant nothing to him. Very probable is the fact that, he knew about the mineral deposits of gold, uranium, mica, aquamarine and other precious stones in this area, but never disclosed; fearing that the human greed will spoil this Shangri-la. Khaptad Swami also knew that, the first one to practice yoga and propounder of ‘ Shankhya Yoga’ philosophy was Lord Shiva himself , and Khaptad was the most suitable place in the earth to practice Yoga and Meditation. He had enlightened thousands of people saying that if one is tired of chemical mixed food and allopathy, he should try to know his body, mind and soul and also get acquainted with Yoga and nature cure. He himself used to wind-back the clock of his life, to an ageless age, when and where, there were only his body, mind, soul and nature, under the shadows of Mahankala ( the God of Eternal Time and Space). For days together, it is said, he could live in this state of ‘Savasana’ without food, in the small cave under his hermitage, while there would be no human being for dozens of miles, and musk deer and leopards were the only company and the Plateau would be under 10 feet of ice. It is rumored that the late King Birendra requested the Swami to keep at least one helping hand as he had crossed 100 years of his life. Khaptad Swami in his last days, had even more detached himself from this world, but even then, the beauty and spiritual atmosphere of Khaptad always charmed him. He had once told this author that spiritual eco-tourism should be developed in Khaptad but strictly in a very careful and planned way. He knew about the fragility of this most beautiful land and its extremely rare bio-diversity, especially of ‘Bog-Land System’ of natural lawns, full of flowering herbal plants, (looking like Persian carpets), shallow lakes-shining like acqumarine and turquoise, and the rolling hills of birch and blue pines. There are some 135 flowering plants recorded in Khaptad National Park situated on an average altitude of 3000m and with the area of 225 sq km, which is really a living museum of natural history and botanical garden. It is here, and only herb in the world, where one can find 400 herbal plants out of some 700 found in Nepal, concentrated within one day’s walking distance. Some 40 mostly rare wild mammals and 266 species of birds are recorded so far to be found here. Khaptad Baba would have been extremely happy to see students of science and culture from the colleges of Nepal, India, Bangladesh and from all over the world, visiting Khaptad Plateau for study tours. But most important tourism product, which he would have liked, would have been the Spiritual Treks and Meetings. Because it is here, where one is in face to face, with the ‘Virat Prikarti’ the most overwhelming ‘Mother Nature’, where one find himself in communication with his own soul and the eternal super soul called the God.